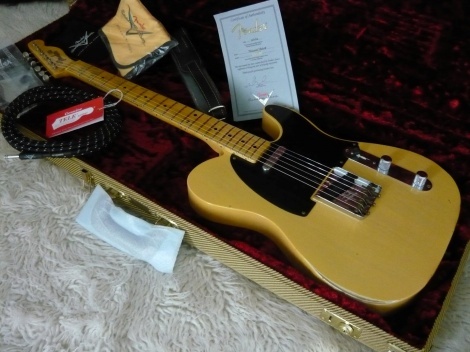 Fender Custom Shop 51 Nocaster - Nocaster Blonde Relic rare find. The Fender Custom Shop 1951 Nocaster Relic looks like a 60-year-old instrument and plays like a dream. If you're a Tele purist with a penchant for early '50s models, we've got your axe. The '51 Nocaster sports a hand-selected, nitro-finished ash body, a meaty 1951 U-shape maple neck with an ultra-playable 9.5" radius and 6105 frets, a vintage bridge with brass saddles, and a pair Custom Shop NoCaster pickups. With stunning vintage visuals, uber-playability, and perfectly tweaked Tele twang, the Fender Custom Shop 1951 Nocaster Relic might be your ideal Tele.